Are mussels and oysters sentient? Dividing organisms up into types, or cladistics, is tricky business. Nature did not develop in a way that fits neatly into categories. Dividing up organisms on the basis of sentience, or the ability to suffer, may be even trickier. So, is there any evidence that mussels and oysters don’t suffer? Let me start with a perspective derived from evolutionary theory about how organisms are designed. The function of pain is to help an organism avoid stimuli that may cause them bodily harm. Organisms that are sessile, or unable to move, cannot escape pain and thus there really isn’t any adaptive reason for them to feel pain. Sessile bivalves can open and close their shells but this is as simple an action as plants who close in the presence of noxious stimuli and for a variety of reasons I won’t go into here, plants don’t feel pain. The definition of vegan typically includes not consuming anything of animal origin. And, as animals are most often motile and thus have an adaptive reason to feel pain, this makes sense. This is very unlikely because pain is biologically expensive4 In order to feel pain an organism must have to have a sensory system capable of differentiating ‘good’ or adaptive stimuli from ‘bad’ or harmful stimuli. On top of this, the experience of pain is often damaging in and of itself. Finally, in order to facilitate moving away from pain an organism’s priorities change. For instance, pain reduces hunger and the desire to mate. Given that no system is perfect and there is always some rate of misfiring, a sessile organism that experiences pain would get all the harm and none of the benefit of moving away from painful stimuli and thus be at a disadvantage. 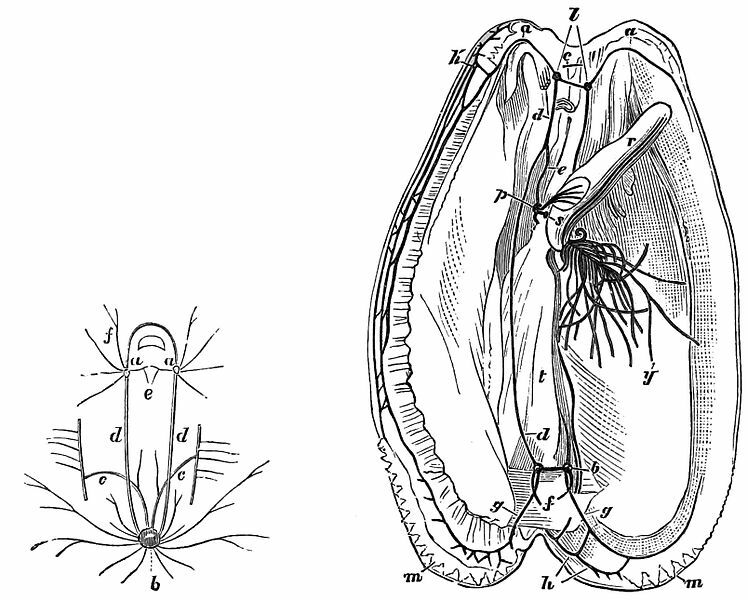 “[The bivalve] nervous system includes two pairs of nerve cords and three pairs of ganglia. There is no obvious cephalization and the nervous system appears quite simple….to our knowledge there are no published descriptions of behavioral or neurophysiological responses to tissue injury in bivalves (Crook& Walters 2011). Translation: Bivalves have a very simple nervous system which is not aggregated in anything like a brain. Other invertebrates, like shrimp, show changes in behavior (e.g. grooming their antenna after injury) neurotransmitters or neural firing in response to injury, but previous studies have not shown this kind of response in bivalves. Many animals have opiate receptors, indicating they are making painkillers and regulating pain within their own nervous system. One way that animal pain is gauged is to administer opiates and see if it influences the behavioral response to pain (e.g.). There is some evidence that bivalves have opioids and opioid receptors but 1) there isn’t good evidence that bivalves have the genes that code for these receptors and 2) it seems that opiates are being used to signal the immune system not to regulate pain. To be honest this is the point on which I am least confident and on which science isn’t yet conclusive. No food is completely deathless. When you eat plants or grains you are often supporting a system that kills insects, rodents, and displaces wild animals. Let’s say that you eat shrimps because you doubt that they are sentient. Even if you are on an invertebrate only diet, many species are dredged or netted which involves bycatch, or the deaths of many other organisms after they are harmed by being brought up out of the water and thrown in again. With shrimp, for instance, the rate of bycatch is enormous, sometimes up to 98% of what is caught is discarded, and much of this bycatch is vertebrates. Surely, eating animals that aren’t sentient could not be ethical if it involved significant numbers of deaths for animals that are sentient. -The only dredging involved in cultivation is collecting spat, or the “seeds” that become mature mussels, however rope cultured mussels don’t generally involve dredging for spat but collecting it on the surface thus not displacing other organisms. -Oyster and mussel cultivation has been endorsed as good for water quality (e.g. they filter out excess nitrogen) doesn’t involve antibiotics and doesn’t involve killing other animals to feed to them as is the case with farmed fish (e.g. this source is not objective but details many potential environmental benefits from shellfish aquaculture). In the next blog I’ve argued that including oysters and mussels as ethically acceptable on a vegan diet undermines naturalistic, nutritional and emotional arguments against veganism thus promoting ethical eating. I’ll also speculate about whether there would be fewer vertebrate eating ex-vegans if ostrovegan was considered an ethically acceptable in a vegan diet. 1-I’m not the first to argue this. This Slate piece from back in 2010 sketches the argument from sentience and Peter Singer has also been on both sides of this argument earlier endorsing and later renouncing the view that eating sessile bivalves is ethically neutral. 2-I endorse giving motile bivalves like clams and scallops the benefit of the doubt and not eating them. Scallops can swim away from predators and have eyes, which makes them a great deal more cognitively sophisticated. This entry was posted in Biology, Vegan and tagged aquaculture, basal ganglia, biology, bivalves, clams, David Pearce, dredging, motile, mussels, oysters, pain, Peter Singer, scallops, sentience, sessile, shrimp, Vegan, vegetarian by Sentientist. Bookmark the permalink. You might be interested to know that the link to the “Line grown mussels” image is not functional anymore. May I suggest you download an image to your own website to avoid that (minor) problem in the future? Otherwise, thanks for a brilliant, compassionate, informed reflexion on a complex subject. That’s all. The rest is just cognitive dissonance, ignorance or sophistry. Self-serving speculation on the (non)suffering of creatures that have no way to prove to us if we’re wrong. It’s already wrong on the basis of the precautionary principle (otherwise known as the Golden Rule). How do you conclude clams/oysters are sentient. The article puts a good argument as to why they are not. What is yours? why do clams sometimes close their shells? There is no ethical case for eating plants. That’s all. The rest is just cognitive dissonance, ignorance(,) or sophistry. Because these creatures are “meat”, e.g. recognizable muscle matter, etc. is not a good enough reason to consider that they feel pain. Because they move in a way that we equate with “animal”, doesn’t mean that they feel pain in the same way as we do. What about the venus fly trap? It doesn’t feel pain because it’s green? Made from different materials? All I’m saying is, let’s do our assessment on a basis of science, and not on a basis of what our evolved instincts tell us about what we’re looking at. does a venus trap close to avoid potential danger? Your comment could not have come off as any more douchey. I love oysters n mussels but since there’s no definite answer to them not sensing pain guess it’s best to leave them be. It all depends on how sincere we are in being a compassion vegan, if one yearns for meat and seafood yet struggling mad in restraining from eating them that itself would actually harm your cultivation if you’re a vegan for the sake of religion. You’ll risk becoming the animal you desire to eat when you think of it at the moment of your last breath….so first sever or tame completely your attachment before deciding to be a real vegan. Good luck. If you can ignore the simple fact that the creature you choose to eat does not want to die just as much as you don’t want to die then go ahead and eat it. Justifying your needs with twisting logic really isn’t necessary or meaningful. It’s clearly a case of you first, which is entirely your prerogative. Nothing wants to die. Do you have any idea how much plants don’t want to die? How hard they work not to die? Pingback: Are Oysters Vegan and Can You Eat Oysters As A Vegan? Everyone has to draw arbitrary lines in the sand somewhere.